I host Christmas Dinner at my house every 2 or 3 years and when I do I like to push the boat right out. I am lucky enough to have a very good turkey grower a couple of miles away from me and he sells “at the gate”. We go so far as to pretend we pick our own from the live birds, but it adds to the “crack”, so to speak. 4 years ago I discovered that my youngest daughter wasn’t a big fan of breast meat but she liked the thigh, as do I, so I came up with a recipe for stuffed Turkey thigh. Removing the legs and thighs allows for the Turkey to sit better in the roasting tin and for the cooking period to be significantly reduced. I cook the turkey crown with an onion and a halved lemon in the cavity, along with a bunch of mixed herbs and I completely cover it with streaky bacon which I remove about 30 minutes before I take the bird from the oven to rest The drumsticks can be roasted under the crown and removed when cooked through (about an hour or so, dependent on size of bird). The stuffed thighs I cook separately, they take about 35-45 mins in a moderate oven and can be done while the bird is resting (the Turkey, not the missus). If you know your butcher ask him to remove the legs from your bird, or, if you feel confident, do this yourself by cutting around the thigh at the carcass and then, using a sharp knife cut directly through the knuckle joint, then separate the thigh from the drumstick in the same manner. Cut through the thigh, down to the bone and carefully remove the bone, leaving as much meat as possible, flatten this piece of meat out skin side down on a board, place a layer of stuffing on top leaving a decent border and then roll up, secure with bamboo skewers or, better still with butcher string. 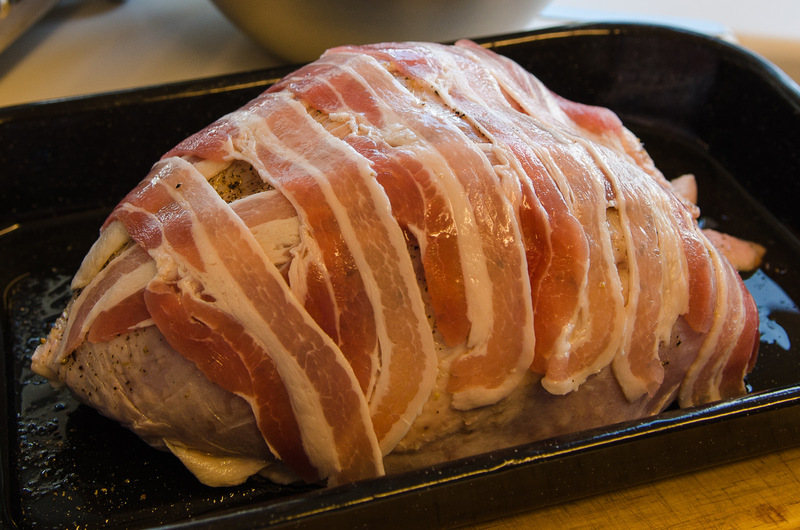 Wrap in bacon if you really want to show off and roast as above, keep an eye on it though. Fry off the pancetta cubes (100 gram or so for 2 thighs) in some oil until just lightly coloured remove from the pan and fry an onion (small dice) in the same fat. Add a pinch of dried sage or 3 fresh sage leaves, finely chopped, 50 grams of butter and 100 grams of roughly chopped chestnut, when cooled combine with the pancetta and 75 grams of bread crumbs. Pepper to taste. Fry an onion as above, add the sage, butter, breadcrumbs and 100 grams of chopped prunes, let it cool and combine with 100 grams of good sausage meat. Pepper and salt to taste. Fry an onion as above but with a clove of garlic, take off the heat add a handful of chopped flat leaf parsley and half a dozen shredded basil leaves, 50 grams of butter, 100 grams breadcrumbs, a diced pear and 50 grams of pine nuts, season well with salt and pepper.